Adorable Sylvie bunny rabbit is from Deb's Easter collection. She has a coat of light grey mohair, with cute pink inner ears. 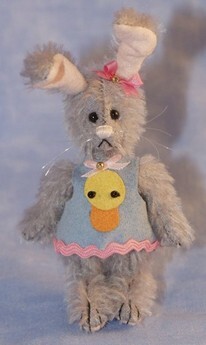 She wears a sweet blue felt dress with duck motif and pink trim, with a matching pink bow on her ear! Each bear comes in a gift box with a laminated certificate. Each certificate has been signed by Deb! Deb Canham's miniature teddy bears are little works of art that are made by hand and have delighted collectors for many years. Deb is now focusing on small editions of bears and characters, made by herself rather than manufactured by her own trained seamstresses, making these miniature bears even more rare and collectable.